Dollhouse Miniature Food - Christmas Macarons in 1/12 dollhouse miniature scale. 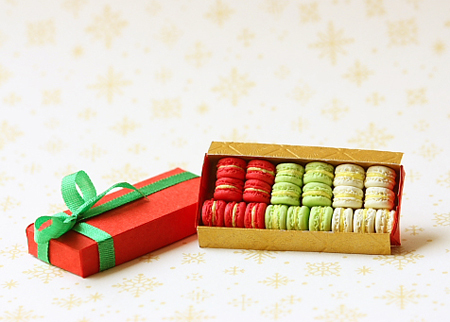 This is a beautiful entirely handmade christmas macarons in a luxurious gift box. Looks so exquisite and have a luxurious feel. Display it in your dollhouse bakery, patisserie, dining table or tea shop counter. Christmas macarons in the flavours of Christmas Spice, Peppermint and Vanilla Bean. All 21 dollhouse macarons are glued to the box. Box measures about 3.9cm by 1.5cm. This is a dollhouse miniature collectible toy for adults. It is not suitable for children.